Release day is just around the corner. I must tell you that Best Served Cold was a labor of love. During the editing process, which were arduous, I explained to my editor that this was the transitional book for me. It was the one, that when I finished, I knew that someday I would be published. Perhaps not this book itself, but it was the first time I'd said, IT IS GOOD. Strangely, I had this book read and critted by nearly every person I knew AND it has had the toughest editing process of all books I've done. Again, I think it was because I started with one set of skill sets and those skills evolved as I wrote the book. Yes, this one is an emotional release. What is better is that Best Served Cold is the first book of seven in the COLD PLAY series.The protagonists in BSC, Evan Jahnning and Dr. Keefe Pearson are the stars in three of the seven. Keefe is an archaeologist and I really want to keep on writing about her. She has been one of my favorite heroines - strong, beautiful, intelligent with a touch of attitude and a whole lot of love for the one man she shouldn't be loving. Well, I'm looking forward to Wednesday and hearing what you all think of this book and my ability as a romantic suspense author. Isn't this a great cover? The talented Dar Albert just keeps on shattering my expectations. 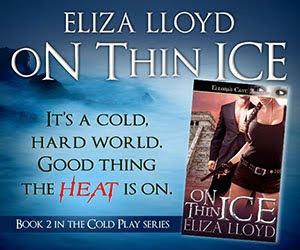 And some side notes, the next book in the series On Thin Ice has a cover. Check it out. Secondly, the newest m.s. in the Wicked Affairs series, tentatively titled Wicked Secrets is done! Now for some crit/edits and it will be submitted to my editor. More about this book in an upcoming post, but I will tell that I think I have done a credible job of taking an irredeemable hero and turning him into a keeper - and some super-tough subject matter for an erotica.